The purpose of the Restaurant Show—this year was its 99th annual—is for food industry folks to connect: Maybe you’re a restaurant chain looking for new tabletops, or you’re a new soda company in search of a distributor, or you’re Jennie-O and presenting your 2018 line of turkey innovations. In years past, more than 60,000 attendees would traverse a convention center space the size of 20 football fields. Though it’s not opened to the public, some of us in the press manage to weasel our way into the show. 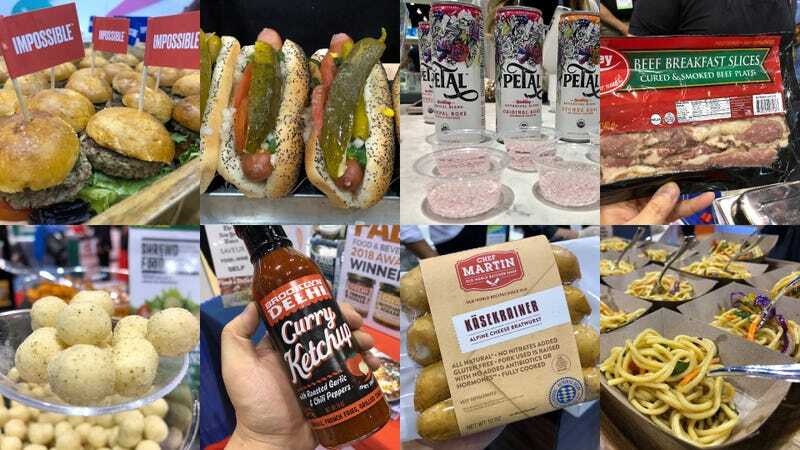 For us, what’s most relevant is the free samples bacchanal—it’s hundreds, if not more than a thousand booths featuring pricey Wagyu beef on toothpicks, fully dressed hot dogs, smoked salmon, and the buzziest new artisan ginger beer. Yes, we are unabashed about our motives: we are in it for the free food, full stop. If you’ve been to a Whole Foods lately, you’ve likely seen the packages of Beyond Burger patties (sold two to a package for about $5). Compared to the soy/black bean/cardboard veggie patties, Beyond Meat (and its competitor Impossible Foods) aims to replicate the beef burger experience. And having tasted both—including White Castle’s Impossible Slider—we can say that both patties taste roughly 90 percent of the way to a beef burger. If you didn’t know, you wouldn’t notice. This year, Beyond Meat is offering a plant-based sausage, which they’re already selling at Whole Foods. And we gotta say, the gap between a meat product and its non-meat counterpart grows ever narrower—Beyond Meat’s brat tastes 95 percent like the real thing. It’s scary and uncanny. New York-based Shrewd Food claims the crouton is the least healthy element of a salad (we’re gonna go with the dressing, actually). Now they’ve come up with something called Protein Croutons. In essence, it’s a bit like cheese crisps, except the company say it’s lower in carbs, fats, and calories. A company spokesperson tells me it’s made from “milk protein isolate”—which accounts for the 10 g of proteins per serving—and dusted with cheese. These are available at Costco in the Northeast. We’ve tasted a lot of sausage in our time, perhaps too many, and Chef Martin’s Kasekrainer now ranks among our top-tier. It’s a nitrate-free pork sausage with Swiss cheese stuffed inside, with a delightful snap to the casing and a pleasurably savory to the link. You’ll find these in supermarkets mostly in the Upper Midwest, but it’s available in New York and Washington, D.C. as well. Here at The Takeout we’re big nerds for ketchup, and it’s about time we popularize in the States a condiment that’s already beloved in Belgium and Germany: curry ketchup. Brooklyn Delhi might be leading this charge with its delicious curry ketchup, which will be on Whole Foods store shelves beginning in June. Yes, in fact, it is ketchup, but with spices you’d associate with Indian garam masala. Do as the Europeans do: Douse curry ketchup over sausage and fries and chase it down with cold lager. It takes a while to traverse the magnitude of the show, but once you find the award winners, that’s a good place to hang out. The show’s FABI awards “recognize the industry’s most unique, delicious, and on-trend products that are driving sales and pleasing guests.” One of our favorite finds down those aisles was Sud’N’Sol’s Pepper Spread and Tomato Spread. The European company features condensed slow-roasted vegetables (the artichoke version was also great) into a series of spreads that would work as a dip, as a base for a sauce, or a flavorful add to a sandwich. Definitely worth seeking out. Beverage-wise, there were a ton of agua frescas at the show—a combination of fruits, flowers, and seeds blended with sugar and water that are popular in Mexico. We found a bunch of different brands to try, often featuring flavors like hibiscus and mango. But our favorite by far was the Barrilitos Aguas Fresca line, recently acquired by Coke. Unfortunately they aren’t available commercially yet, because the pear-cucumber was spectacular: not too sweet, the combo was odd enough to be interesting, and completely refreshing. These might even eventually rival the sparkling water market. But that area still has its own innovations: We met the local creator of Petal, which released its new line of rosewater-flavored sparkling water at the show. There was a mint rose, and a lychee rose, but we headed straight for the original rose flavor. It was definitely intriguing, and would likely please fans of edible flowers and violet gum.